Why exhibit your artwork in a small and crowded gallery space when you can present it on acres of open land instead? The obvious answer is the access to people. Collectors, dealers, and scholars are all abundant in major cities like New York. So, if you’re able to showcase your pieces in a gallery there, then you’re more likely to make a bigger impact on the industry. Though, if you’re already famous enough, you might be able to pull off a destination art installation. Well known land artists like Robert Smithson, Nancy Holt, and Walter de Maria have all proved that taking the risk of presenting a work of art in distant isolation is often rewarded with great critical acclaim and a long lasting statement. Together, these influential artists created the Land Art movement that surfaced towards the end of the 1960s. Their campaign served to link the natural earth with art works, which were presented in various landscapes around the world. In the early 1970s, artist Donald Judd followed suit with his contemporaries and escaped the hustle and bustle of New York in favor of barren land in southwest Texas. Initially attracted to the clean and empty deserts of the area, he found solace in a peaceful environment far away from the hectic life he led in Manhattan. What started as an occasional retreat soon became his permanent residence and Judd eventually settled into a rented house in Marfa, Texas. With growing admiration for the area, he started to purchase more of its land and vacant buildings, including a 60,000 acre ranch known then as the Ayala de Chinati. Initially developed by Judd and the Dia Foundation, today the ranch has transformed into a private art museum run by what became the Chinati Foundation. Earlier today, we had the chance to take a guided tour through its galleries, gain some insight into the mind of Donald Judd and hear a bit about what life is really like in Marfa, Texas. Chinati can be best described as a Disneyland for artists, which with its building’s basic architecture isn’t easily apparent until you explore the grand property. Prior to Judd’s purchasing it, the Ayala de Chinati was an abandoned United States Army base. The former base is filled with many simple looking buildings that feature subtle yet very unique attributes- a line of U shaped buildings with gardens filling the space between their curves, massive one floor units with round silver roofs, and more. But what’s really special about these many buildings is what’s to be found inside them. Once Judd’s residency began, he invited artists from around the world to come and contribute their creativity to the property. In this massive space, the possibilities seemed endless and the results varied dramatically. Specifically, the line of U shaped buildings held some of the most interesting artistic concepts. The first six U shaped buildings were gifted to minimalist artist Dan Flavin, who’s famous for his installations made out of fluorescent lights. To our amusement, these buildings housed the same type of sculptures Flavin became well known for. Using only four neon colors- pink, orange, blue and green, Flavin utilized the connecting spaces in the linear U shaped buildings to create a series of vividly lit tunnels. Each building featured a different color combination and set up that evoked a variety of patterns against the interior’s white walls. At first, the buildings were fun to go through, but after the first three they became a bit predictable and redundant. Although I appreciate minimal art, I kept imagining alternative uses for the buildings that housed Flavin’s sculptures. I’m sure at night, these neon structures are more powerful. It would be amazing to host an event in these clean white spaces, with only Flavin’s bright colors decorating the space. In a way, they reminded me of the lights in Times Square- so busy, so bright, so tacky, but in the best way possible. Here, they were presented as works of art hidden in a large gallery space. It was an interesting concept, one that seemed both misplaced, but just right at the same time. Moving on from the U shaped buildings, we visited a much larger space, with tall ceilings and round silver roof, filled with the works of Donald Judd. These works were an untitled series of 100 aluminum boxes. From a distance, these boxes all looked similar, but a closer look allowed you to notice that they are all different. How Judd could come up with 100 variations of a sculpture is beyond what I could fathom, but I found its simplicity to be grand and beautiful. We visited this building once in the morning and will be back for sunset. Like the other Land Art works we’ve visited, Matteo and Alex promised a different view on the works when the sun was fading at the end of the day. If they were this amazing now, I can’t imagine how they’ll look at sunset. The property held so many different buildings, featured a great variety of artists and creative mediums; it was such an amazing experience to have the opportunity to view Chinati. As our tour guide finished taking us from building to building, she extended us an invitation to stop by her own art studio. 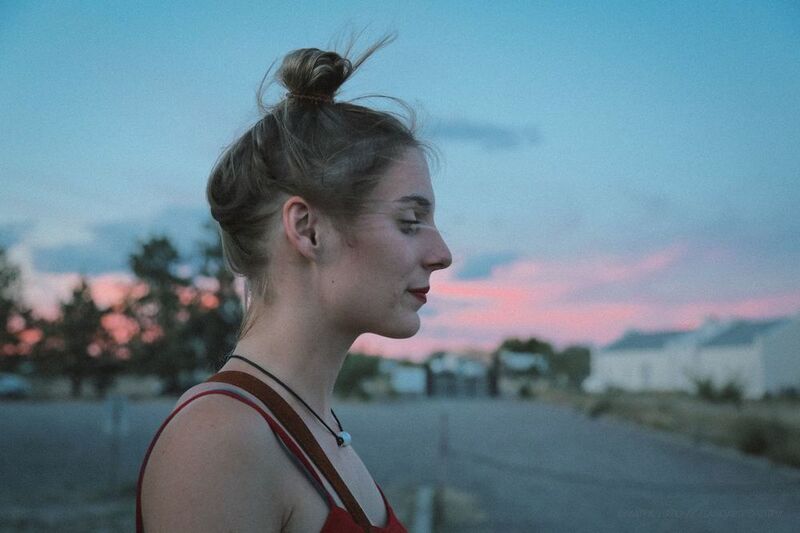 She told us that she and her husband decided to move to Marfa for the inspiration it provided and the support artists had here, but what puzzled me about it all was the statement she made on the amenities available in this small town. “It’s seven hours to the closest hospital,” she repeated after receiving a surprised look from the crowd. Seven hours? That’s a huge health risk for the love of art. It made me wonder what else Marfa has in store for us. With so many works of art and artists in residence here, it must be something special.